On Rooflines, bloggers have written directly about events in Ferguson, MO, and indirectly analyzed the social ramifications of racial and economic discrimination going unchecked in communities. From “Three-Strikes” Law enforcement, to sentencing disparity among races in crack/powder cocaine offenses, to aggressive policing strategies in communities of color, the relationship between law enforcement and people of color in the communities they live has historically been an adversarial one. At the very least, this adversarial relationship leads to mistrust of law enforcement and subsequent weakening of community/police partnerships; at most, it leads to death. In light of recent developments in the deaths of people of color at the hands of police officers in New York and Ohio (and Phoenix and LA and…); and the unprecedented expressions of outrage through demonstrations in cities all over the country, Shelterforce would like to hear from our readers in the community development world about what you’ve been doing, are planning to do, or want to do to address the way law enforcement interacts with residents in the communities you serve. Share your opinions, ideas, and stories about what's working and what isn't. Please take our survey here. We invite you to share the survey with your community partners that may not subscribe to Shelterforce Weekly. 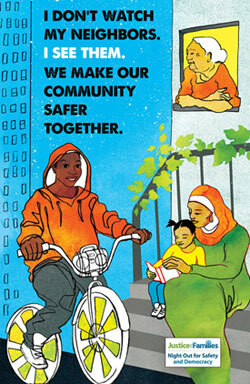 (Image credit: Poster designed by Micah Bazant for the organization Justice for Families for their “Night Out for Safety & Democracy” event. Image is from the Justseeds Artists Cooperative website).